Just layer in a glass and enjoy! This delicious recipe is from Dr. Johana Budwig’s anti-cancer protocol. However it’s a favorite meal or snack anytime! Dr. Budwig was a brilliant German doctor who had 95% success rate healing cancer. Nominated for the Nobel Prize seven times, she discovered that when unsaturated fats and protein are introduced to sunlight, this activates vital healing solar electrons in the body. Hmmm… tell me more. The medical and food industries did not take kindly to her findings. 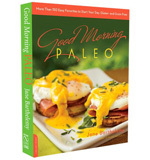 Check out her amazing book: The Oil-Protein Diet Cookbook. This recipe contains dairy, so it is not Paleo. However prehistoric evidence suggests that our Paleo ancestors may have enjoyed fermented dairy foods. A less industrial choice would be unpasteurized yogurt, however it’s not easy to find…. Yogurt, flax oil, flax seeds, honey, and fruit make a fantastic snack. Follow the instructions carefully to benefit from the anti-cancer qualities. It is very important to use freshly ground flax meal immediately, as its delicate oils can easily become rancid. In a handheld coffee grinder, grind 2 tablespoons flaxseeds. Place the ground flaxseeds in a cereal bowl and stir in the honey. Yum! In any blender, add the flax oil and yogurt. Don't add anything else. Blend until creamy and completely emulsified, about 1 minute. Pour the creamy yogurt-oil mixture on top of the flaxseeds in the bowl. Oh Yum! Top with fruit, cinnamon, and nuts. Heaven!